After talking with my wife Doris and daughter Allison in 2008, we decided to begin taking steps towards making this documentary a reality. The first thing I did was contact Edgar Rice Burroughs, Inc. in Tarzana, California. Jim Sullos is the President of the company. We talked by phone and he had no objections to my moving ahead. So, we began our journey. In my research, I was excited to hear that Elmo Lincoln's daughter, Marci'a Lincoln Rudolph was alive and had written a book about her dad. I contacted her and purchased her book. After reading it, I called her and asked if I could come out to California and interview her. Marci'a was receptive to our videotaping her for our documentary. About this same time I found out about the Dum Dum convention in Dayton, OH. I decided to see how much we could get on tape in one trip by going to Ohio and California. It is a good thing that we are working on a subject that so many people are very open to discuss. In addition to working on this documentary, I am the art director of Sci-Port: Louisiana’s Science Center, I develop television show concepts, teach cartooning/animation through the continuing education department at LSU-S and take on work as a freelance graphic designer and caricaturist. 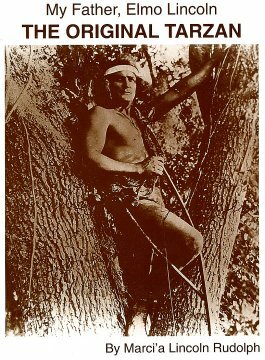 At present, I am using the money I earn doing freelance to pay for the Tarzan documentary. I have applied for grants and I am now waiting to hear if the state of Louisiana thinks I'm worthy. In the spring of 2009, I earned enough to pay for the entire trip to Illinois, Ohio, Kentucky and California. I will deal with other behind the scenes stories from that whirlwind trip later but for now I'll talk about Marci'a and the movie theater. 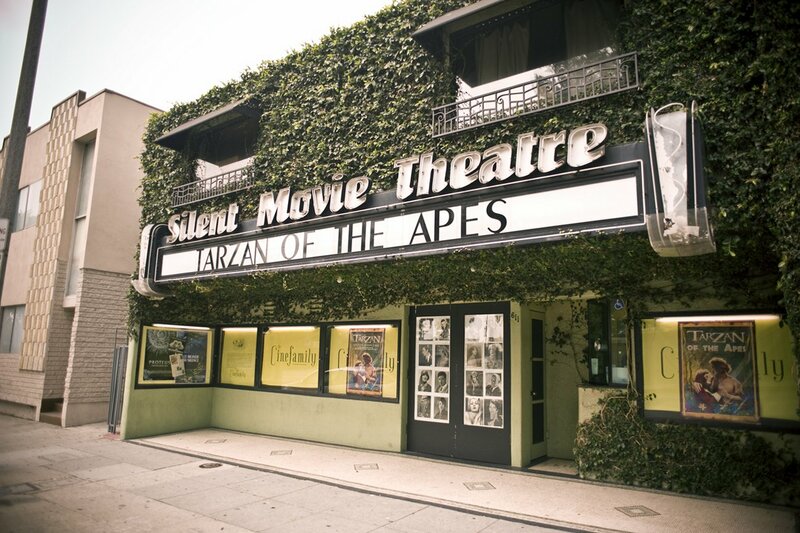 In one of my phone conversations with Marci'a, she mentioned that there was an old silent movie theater in Los Angeles that had shown the original Tarzan of the Apes film. I mentioned this to Allison and we both felt that it would be great to film Marci'a watching the film of her father. I did some snooping and found the theater and it was still operational. Of course, the owner who knew Marci'a had been in a car accident and had perished or sold the theater. I had to call a bunch of times, but I finally found the person who handles special events. She was pleasant but adamant about being paid to show the film and interview Marci'a in the theater. I wasn't really accustomed to this concept. In Louisiana, if I needed to interview someone in a theater, the attitude is it is okay as long as it is before regular business hours. I had also contacted the L.A. zoo and asked if I could come in with a camera and video tape the primates from the sidewalk. I told them that I wasn't bringing any sound or lighting equipment. They said that I could video for a ton of money and I also had to pay a biologist or some other "ologist" to walk around with us to keep us from – I don’t know what they thought we might do to the animals. Anyway, the zoo was out. I spoke with Allison and she still thought it would be a good idea to use the theater. The special events person met me half way and said a contract was on the way. After waiting about a month, I called and wrote the theater contact but received no reply. After another month's wait, someone answered the phone. My contact had been let go and not only was the amount agreed upon not enough, they wanted about three times the amount. They finally shaved it a little, as in a sliver, and we made an agreement for two hours use. The time worked for Marci'a, the theater and us. Allison and I flew into LAX from Cincinnati and Doris my wife came in from Louisiana. I had booked a motel that was not very far from the theater because everything I had ever heard about driving in Los Angeles made me think that all traffic everywhere is bumper to bumper all day and all night. The motel was really a dump. Everywhere we had stayed on the trip had been really nice AND less expensive. This was a dump. There wasn’t even an electrical outlet in the bathroom. 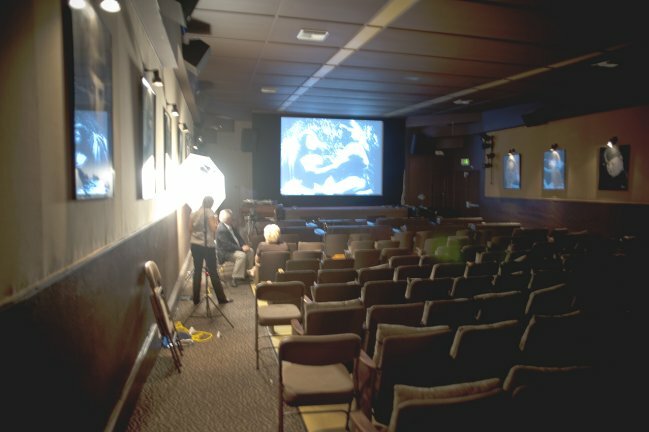 We arrived at the theater early on Monday, August 16th and set up before Marci'a arrived. The theater was perfect and boy was it old. There were giant photos of Chaplin and many more luminaries of the silent era. There was a piano and organ down near the screen on both sides of a small stage. Marci'a arrived and we got right to work. We only had the theater for two hours and not a second longer. She was a nice person. Even with all the lights on in the theater it still resembled the "Bat Cave." We moved a chair right up on the little stage and had Marci'a watch the film playing on the big screen about three or four feet from her. This was the only way we could get any effect of the light and shadows dancing on her face from the film. We handed Marci'a a small bucket of popcorn and an empty fountain drink cup with a lid and straw. They were just props. I had requested that the theater keep some of the popcorn from the night before and give us a cup. They were ready with our request for stale popcorn that morning. Doris wanted to save the bucket and cup as possible collector's items someday. Returning home on the plane we couldn't fly the bucket and cup without messing them up. Christine our daughter-in-law mailed them to us. She has a really great sense of humor. She boxed the bucket and cup up and carefully packed them as if they were Ming vases. Needless to say, it cost more than a bucket of popcorn and cold drink at the movies to send them. The bucket and cup (with lid and straw) are truly collector's items. They are collecting dust somewhere in our house now. Next, we moved Marci'a around the theater and took multiple shots from every angle. Then we turned on our light kit and interviewed her about seeing her father on the screen again and that sort of thing. With the time remaining on the theater clock, we reenacted Marci'a walking up to the theater outside. 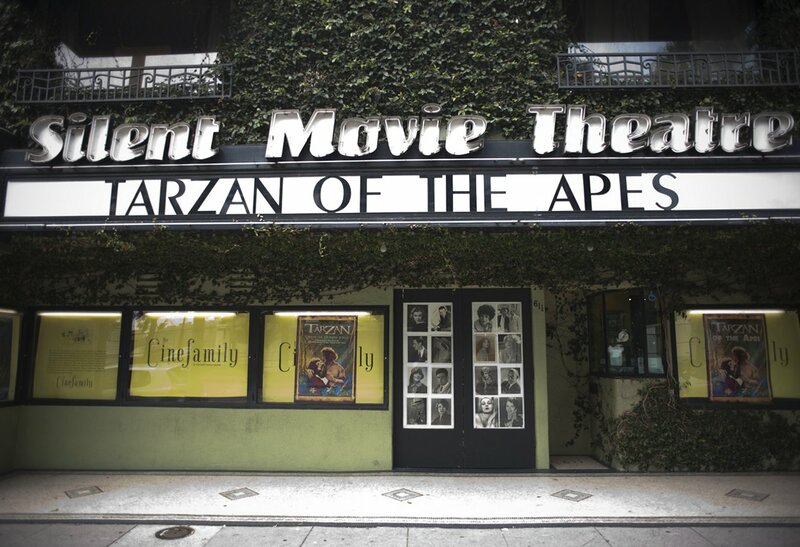 I had prepared special movie posters to put up out front and the big marquee said "Tarzan of the Apes." Allison videotaped Marci'a buying a ticket, getting her concessions and finding her seat in the theater. Of course, it will be edited into the correct sequence. As the clock struck 11 a.m., we were packed up and out on the street with our equipment when our two hours were up. We ate lunch with Marci'a at her son's restaurant and then went to her home to continue the interview there with her telling about her father and showing various objects of interest. The afternoon was capped off with a super-duper interview with Tracy Griffin. He is a walking encyclopedia about Tarzan and the movies. We had dinner with Tracy and enjoyed getting to know him. I will share more about Tracy in another installment of the stories behind the story. Oddly enough, the bumper to bumper traffic didn't hit us until we were heading to LAX from San Diego to catch our return flight to Shreveport. This is the old Silent Movie Theater in Los Angeles that we taped part of Marci'a Lincoln Rudolph's interview. two of the three posters I had made and presented at the Dum-Dum 2009 in Dayton, Ohio. We had Marci'a sit in several places in the theater to get the best angles possible for the interview. At this point, I was asking her about what it was like seeing her father Elmo Lincoln on the screen again. 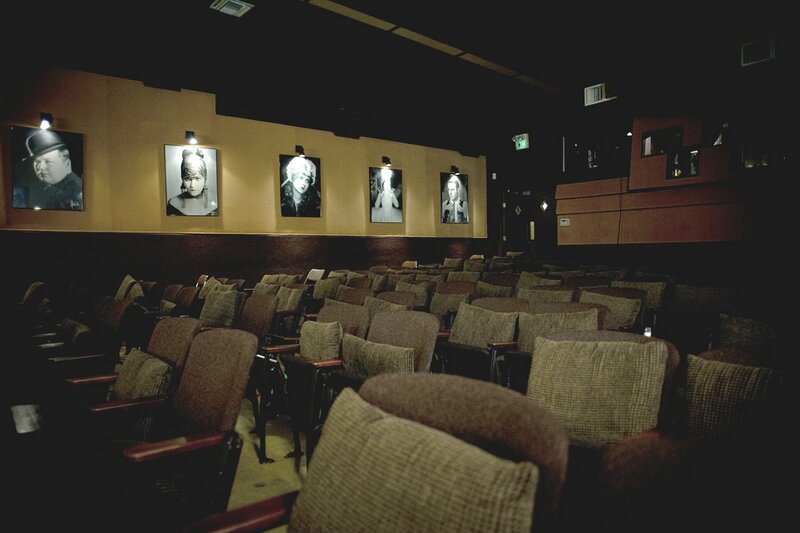 Both sides of the inside of the theater had large photographs of silent screen idols hanging. Some I knew the name but others were strangers long forgotten by most people.